I’ve been invited to give a talk about writing at a school next week. Fantastic! But also – seven hells, what on earth will I talk about? Luckily I made copious notes when I went to a very good talk by Paula Rawsthorne and Dan Tunstall a few weeks ago – about the kinds of things they discussed, and how they approached it. So using that as a starting point, I sat down yesterday to come up with some ideas. But one thing I’ve learnt from my occasional (and much hated) task of having to train clients at work is that no matter what goes wrong (and stuff always does) DO NOT let them sense your terror. The same is doubly true of teenagers. Though they fill me with bowel-loosening horror, I will endeavour to maintain a calm and carefree exterior. The other thing I’ve learnt is that it all goes a lot better, and the things that go wrong won’t matter half so much if the first thing you do is establish some rapport*. Paula Rawsthorne did this very well – asking the teen members of the audience about what books they like and what they don’t like (I nearly cheered myself when she said, ‘Oh good, I’m so glad you don’t like Twilight!’). She also told a very funny (and gross) story about being puked on by a child. Unfortunately I’ve never had that honour. I’ll have to think up some other way to make myself amusing and gently self-deprecating. Suggestions..? Oooooookay. Where the hell do you go from there? As it happens, the only way from there is up. And interestingly, the same guy offered me a crisp later, so I guess he wasn’t afraid of catching girl cooties. 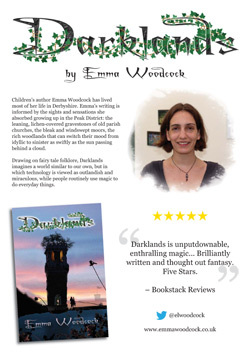 Celebrating Cromford was a great success for Darklands. I took a tiny corner of the WI stall (selling handmade bags, jewellery, etc) for a my flyer and a stack of books (I offered to pay a share of the stall cost, but they wouldn’t hear of it). I bumped into lots of old friends, as well as meeting some new people. 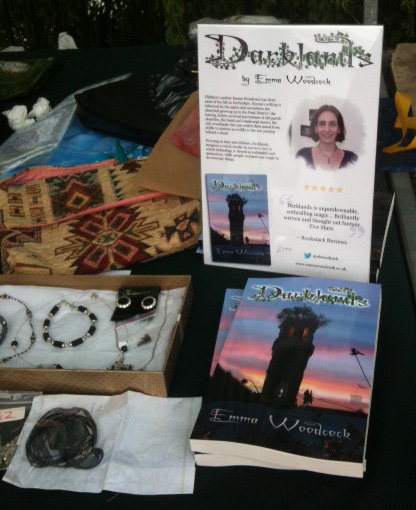 My mum proved an excellent salesperson (“Have you seen my daughter’s book? It’s very good.”) And I sold (and signed) seventeen copies of Darklands (while others around me complained of slack trade. I’m afraid it did rain quite a bit). Now I just hope my new customers enjoy it, and leave me some good reviews. This is very encouraging, and has fired up my enthusiasm for promotion. I’m hoping to fit in a school visit early in July (but timetabling is proving tricksy), and I would very much like to get involved in the Wirksworth Festival. Wirksworth is a larger town than Cromford, and is where I went to school. The festival is also a lot larger and very well established. I will know LOADS of people there, so it could be a really good promotion (and sales) opportunity. Today I’m taking Darklands on the road, to the Celebrating Cromford festival. This is my home town, so I’m hoping to generate a bit of interest. I have a box full of books. My mum has blagged me a corner of the WI stall. I have a flyer with some blurb about me (playing up the local angle, of course), my bestest review quote (thank you, Bookstack), and some contact info. I have a nice little perspex stand for it – so the rain will only gradually seep in the sides and destroy it during the course of the day. Only slight fly in the ointment is an annoying glitch in the distribution process. I finally got in touch with Feedaread to see what the hold up was (after politely waiting the advised six weeks like a good girl). It turns out they were waiting for me. I had asked a question about something. They had answered it. Apparently they were waiting for me to say ‘no thanks’ and HAD NOT BEGUN THE DISTRIBUTION PROCESS. Grrs. I need to look into this further (and don’t have time today, what with Darklands on the road and all), but I don’t recall any indication that either a) I was expected to answer, or b) Not doing so would hold up the distribution process. Why would it? To balance that negative impression of Feedaread, I was impressed that my box of books actually arrived in time for the festival. It only occured to me to sell there last weekend. I ordered the books on sunday, thinking I’ll use them for some promotional purposes if they don’t arrive in time for this. They came on Thursday. That’s pretty good for print on demand. Anyway, the take home message: If you’re in Cromford today, come say Hi 🙂 I’ll be on Scarthin somewhere, hopefully. I saw this post today about creative people providing positive role models for girls. It’s a new venture to showcase non-stereotypical products for girls. They don’t want pink things (unless they’re science kits), nor are they interested in things related to external beauty. I signed up, as a purveyor of self-rescuing heroines with maths skills, and it made me recall some of the interviews I’ve done during the course of promoting Darklands. I’ve cherry-picked a couple of relevant pieces below. I wanted to be James Bond. I wanted to be Tarzan. I wanted to be Dracula. I wanted to be a mad scientist with sticky-up white hair. I wanted to be a pirate. I wanted to be a Viking. Eventually I realised that writing would allow me to be all those things. 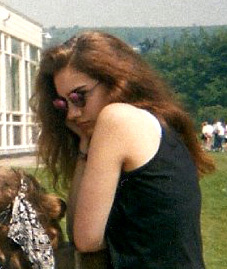 And btw, it wasn’t lost on me that all my childhood aspirations concerned the male characters. Why? Because they got to do the interesting stuff. What did the female characters do? Stand around squealing, and then run away and trip over nothing! But I’ll give you this answer: Many years ago I nervously gave one of my first stories to a friend to read. She was far kinder than it deserved, but what I chiefly remember is her asking quite pointedly, ‘How come interesting things only ever happen to beautiful girls?’ A very good question! I have given far more thought (or maybe far less thought?) to my characters’ appearances ever since. Plus, I just like geeks. 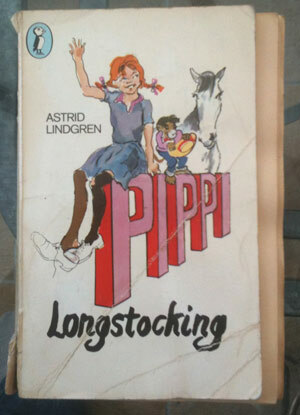 * I have since thought of one geniune female role model I had as a kid – Pippi Longstocking, who is just ace 😀 In fact, she’s so good, I think I’ll have to do a post all about her another time.